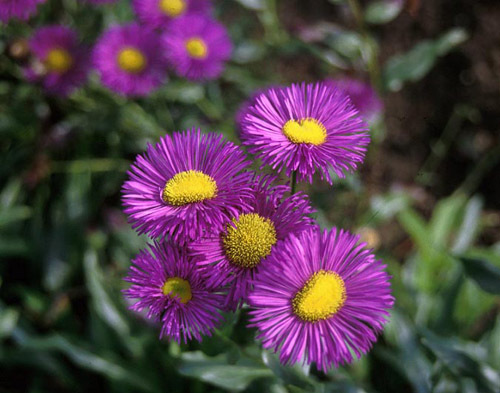 Easy to grow and not fussy about soil, Daisy Fleabane has a long flowering season in summer, producing yellow-centered, daisy-like blooms in shades of white, pink, yellow, purple, and blue. 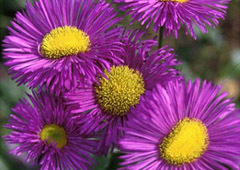 Fleabane prefers a site with some noontime shade, especially in warmer climates. Prefers rich, fertile soil that is kept moist but not soggy. Doesn't perform as well in the heat of Zones 7 and 8 as in cooler regions. rock gardens - The shorter, alpine species are especially well-suited. Flowers borne on erect stems rising slightly above the foliage. cut flowers - Make excellent cut flowers if picked when fully opened. Propagate by seed, division or separation - Sow seeds in containers in mid- to late spring. Divide plants every 2 to 3 years in the spring. Discard woody old growth and replant new, soft rosettes. Divide every 2 to 3 years in spring to maintain healthy plants. May need staking, especially on fertile soils. Keep soil moist in summer. Cut back after flowering to encourage repeat blooming. Deadhead frequently for prolonged flowering. Cut back plants in fall if they become leggy. 'Azure Fairy': 1.5-foot-tall plants with yellow-centered purple-blue blooms. Syn. E. 'Azurfee'. 'Charity': 2-foot-tall plants with semi-double pink-purple blooms with yellow centers. 'Darkest of All': 2-foot-tall plants with gray-green leaves and dark blue-purple semi-double blooms with yellow centers. Syn. E. 'Dunkelste Aller'. 'Dignity': 1.5-foot-tall plants with gray-green leaves and magenta-purple blooms with yellow centers. 'Foersters Liebling': 2-foot-tall plants with gray-green leaves and dense, bright magenta pink blooms with yellow centers. 'Gaiety': 2-foot-tall plants, a profuse bloomer with yellow-centered bright pink flowers. 'Prosperity': 1.5-foot-tall plants with dense, nearly double blooms that are purple-blue with yellow centers. 'Quakeress': 2-foot-tall plants with gray-green leaves and yellow-centered white blooms flushed with pale pink. 'Serenity': 2.5-foot-tall plants with yellow-centered bright purple blooms.